My pet is called Patcher. She is 12years old. Patcher is a furry, blue worm. She is very mean. She can fly. Patcher likes to take things from people. She flies over people taking things from their hands with her teeth. She makes a mess with the things she steals in her house. She has a mat in her sitting room. She has rollerblades and rollerskates. Her favourite thing is her pencil case which she brings to pet school. In pet school Patcher is learning how to balance on rollerblades. My imaginary pet is a goat. He lives on a farm and eats hay and vegetables such as potatoes, lettuce, broccoli and carrots. He is grey in colour. He has yellow eyes. He has big ears. He lives in a big red and white barn with his friends. His friends are the pigs, ducks, sheep, a horse and a barn owl. He likes to run super fast like an ambulance or a police car. For fun Jerry and I like to play Cops and Robbers, and Cowboys and Indians. My imaginary pet is called Ginger. He is a dragon. He is five years old. Ginger is nice and shiny. Ginger is green and has blue spots. He has black eyes. He is a boy-dragon! He drinks water and eats sausages. I think he would like noodles too. I wish my dragon had super powers.. I think he would like to come to school someday in my bag, but Múinteoir Jennifer would get a fright! My pet is called Ra-Ra. He is my per dinosaur. He is very big, has sharp teeth and has a very long tail. Ra-Ra has very small arms. He lives outside in a cave. He loves to eat sweets and cake. Ra-Ra likes to play and run around the garden and hide. My pet is called Koala Bear. My pet is a wolf. His fur is pink, red, orange and blue. He lives in a kennel space ship. He likes to eat dog food and drink milk. Koala bear is a boy and he likes to play ball. He is little and his big teeth. He has very good eye-sight. He is very loud and he howls and cries. He fights and bites when he is cross and he can battle people. He has 5ears because he is 5 years old. He likes to eat biros. Koala Bear comes to my house when I invite him. My pet is an elephant. His name is Harry. He is grey in colour. He lives in the jungle with other wild animals. He likes to eat peanuts, cheese, ham and marshmallows. He drinks water and coke on special occasions. He likes to give me rides on his back. He lifts me up with his trunk. I can see everything when I sit on his back. Sometimes he lets me sit on his trunk. My imaginary pet is called Moo. My pet is a puppy. Moo lives in a dog box just outside my house. She eats dog food, bread, scraps and even some of my chocolate! I like to tickle Moo’s tummy and then she roll’s over and stretches her paws. Sometimes I bring her into the school and Daddy goes mad! Moo is my very favourite pet. My pet is called Spiky. He is a 3 headed spinoboat. He is brown and yellow. He has 19 legs and 3 heads. He has scaly skin and a spiky tongue. He has 15 wings. He eats frogs and drinks water from the pond. Spiky loves to fly and play catch with my brothers per dog Rudy. He also likes to scratch my back with his 19paws. He likes to fly away from me and I try to catch him. Spiky has a pillow bed beside my bed and he likes to cuddle up at night with his favourite teddy ‘Brother Conor’. My pet is a donkey. He is back and white. Buttons lives in our back garden. Buttons eats grass and horse food. Buttons likes to run and jump. My pet is called Spike. My pet is a shark who can fly. He is grey with green zig-zag designs. He lives in a big pool outside my home. Spike eats fish and old clothes. He loves water and milk to drink. He likes to jump out of his pool and fly around the field. Spike likes to swim and fly up in the clouds with the aeroplanes. He is a friendly shark. My pet is a dog with wings. He can shoot fire and knock down caves while he is flying. He is red and black. He lives in a jungle with have lots of caves. My pet is called Speedy. He is brown in colour. Speedy lives in a field. Speedy eats grass and nuts and he drinks water. Speedy likes to jump over ditches and run fast. My imaginary pet’s name is Oscar. He is blue with white strips. He also has a green horn. Oscar likes to eat vegetables especially tomatoes, carrots and cabbage. He likes to play in the air near my house. Oscar also likes to tell jokes. My pet is called Stormfly. He is brown and red. Stormfly lives in a big cave on a beach near the ocean. He eats fish and sometimes rocks. Stormfly likes to fly upside down and loves to scare people! My pet is called Henry. He is a giant dog. He has big ears that are great for hearing with. He is brown and white and he has big white teeth. Henry lives in the bushes near my Granda’s house. Henry eats giant tins of dog food and drinks lots of water. Henry likes to jump over gates and wires and loves rolling around in muddy puddles. I love to play with Henry! My pet is called Pudsey. He is black and red. Pudsey lives in the forest near my house. Pudsey eats apples, pears and sausages. He loves to drink water and milk. Pudsey loves to play with me. He won’t sleep at night if he doesn’t have his teddy. My pet is called Tom. He is green and yellow with blue hair. He lives in the island wood, under the bridge. Tom loves nuggets and chips. He likes cheese and burgers too. He drinks orange juice and cranberry juice when he is thirsty. He plays cops and robbers with me. He is always the robber because he is big and scary. He gets angry when he sees zombies. Junior and Senior Infants learn lots of rhymes and poems in school, but they also love to create their own! Below find some examples of cinquain poetry the boys created in class this year. Happiest when he is racing. Hopping in the long grass. 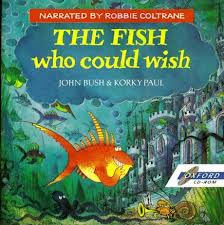 This week in school our teacher read us the story ‘The Fish who could wish’. After hearing the story we thought about what we could wish for…..
Fionán would wish for a holiday in Spain with Dylan O Connor for two weeks, and Ciaran Lynch said he would like to live in Spain because the weather would be lovely there. Morgan and Philip would love to live in Symths’ toystore, and Kieran Moynihan would wish for all the toys in the world! Alan closed his eyes and wished really hard for a grey horse, who would live in the field near his house. Aidan said that if he was the fish in the story he would have wished to live in a big, glass bowl with clean water. Kevin would like a gun for shooting rabbits! Josh, Ciaran Roche, Reese and Darragh Daly decided that they would wish for a skateboard. Jack wanted a star from the sky because he is afraid of the dark. A small, brown dog called Lucy would be just perfect for Coiln Lehane. Michael and Diarmuid both wanted red cars to drive around Newmarket! Tyler would wish for a red bike, Niall would love a rally car and Dylan wanted a motorbike. Daragh Clifford would wish for a REAL tractor to play with! Would Batman and Robin have a room for Fionn in their house? Denis would have plenty rooms; he would wish for a castle! And Alex thought long and hard about his wish; in the end he decided he would wish for a hundred more wishes!